Being a dreamer will break your heart. It will leave you empty-handed on the side of the road. Lost in the middle of the hot desert. Grasping in the midst of crashing waves. Because dreams can only end in one of two ways. They will either be fulfilled or they won't. And there will be a time when they won't. And it will hurt. You leave a part of your heart with every dream you lose. And sometimes, in the wake of a lost dream, it's tempting to think that dreaming is dangerous. To decide to never dream again, to guard yourself from the hurt. But I have learned, through the painful loss of closely-held dreams, that nothing is truly ever lost with a dream. Dreaming will always change us and mold us and push us towards interests we may have never had otherwise, and so even in the loss of a dream, we can know that the dream had a purpose. But the very best thing that I have learned is that God will never allow a dream to be taken unless it is for our good. He loves us deeper than anyone ever could... that includes ourselves. He loves me deeper than I even love myself. So when I lose a dream, I'm devastated because I am certain I have lost the thing that was very best for my life. How could anything be better? I wonder in those moments. But God knows, in his infinite mind, that there is something better for my life, and he doesn't want me to miss out on it. So in his goodness, he takes a dream I hold dearly, so that he can give me something even more wonderful. The best example of a lost dream was in Jesus Christ himself. The disciples, and many other followers of Jesus during his lifetime, held lofty dreams in their hearts of who Jesus was and what he had come to do. They gave up home and family and career for him. They gave up popularity and solitude and safety for him. And then, on a dark and awful night, their dreams came crashing down. They watched as their Dream hung battered and bruised on a cross, and their hopes of him being their Messiah and King died along with him. How could he be their Savior if he lay dead in a tomb? None of it made sense, and their hearts felt defeated. But God knew what they couldn't understand. God knew what he had been planning since the beginning of time. He knew what was best for these hopeless and lost dreamers, and what was best was for their Dream to die. Because ultimately, the death of their Dream was going to give them life... abundant life that could only come with death. When Jesus rose from the tomb three days later, his resurrected life proved to the disciples that there was something even greater than their living Dream. The death of their Dream was what accomplished everything they really wanted. Through his death, Jesus became for them their Messiah and King and Savior. Their Redeemer and Reconciler and Freedom. Their Life. 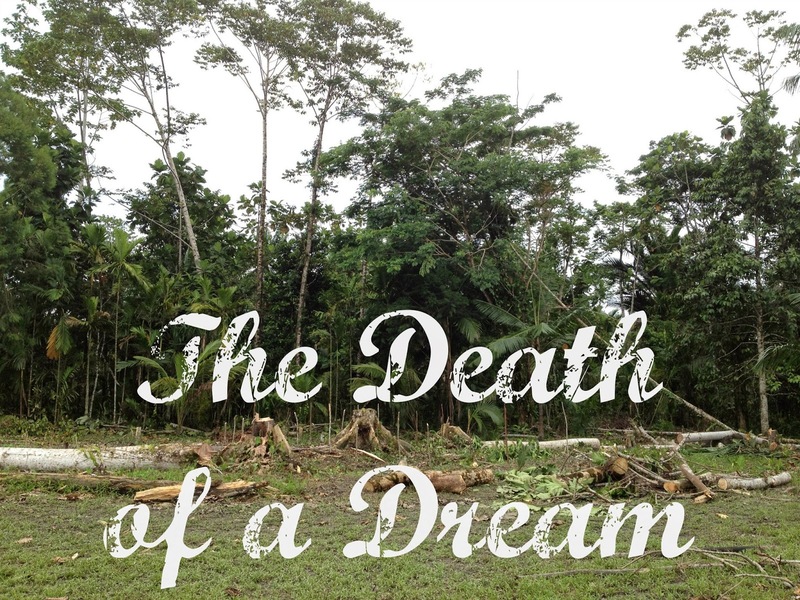 The Death of their Dream became their Life. So dream on, my friends. Never, never stop dreaming. But when those dreams are taken, cling to Jesus with all your might, and trust that he has something far greater for you. So good, Alisha. Keep writing. Keep learning. Keep leaning on Him. Love you dear friend.